Disney Parks is offering the chance to meet Tinker Bell and her Fairy friends at your choice of Walt Disney World Resort in Florida or Disneyland Resort in California via a contest they are holding at PixieHollow.com. It’s a celebration of all-things Fairies at the place where dreams come true. A special meet and greet with Tinker Bell and all four of her Fairy friends. Four “Magic Your Way” Tickets with Park Hopper option. Accommodations at a Disney Resort hotel. Round-trip airfare for the winner and three guests. Don’t forget that at PixieHollow.com, you can live life as a Fairy every day. 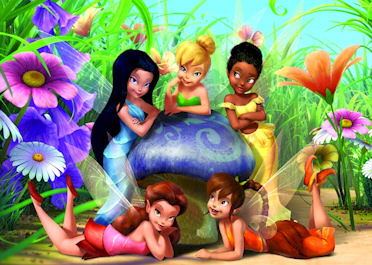 Fly into the online world of Pixie Hollow for flitterific fun and excitement with Tinker Bell and her Fairy friends. Become a Fairy, make tons of friends, play talent games, and show off your Fairy style. To enter for a chance to win, simply visit PixieHollow.com and then log in and enter the name of your favorite Fairy between now and February 2, 2009, 12:00 pm PST. One lucky winner will be selected. Twenty runner-up winners will receive a Pixie Hollow t-shirt!